On the New Moon of October 2007, I had a vision that my house was swallowed up in a land slide. I listed the house for sale the following week. I wasn't sure what was next - everything was wide open - then I sat before the Dalai Lama on October 31, 2007 on his "Art of Happiness" tour. My house sold immediately and closed on November 1, 2007. I moved away from the house I had lived at the longest in my life, leaving my past behind in the middle of a blizzard. Now free as a bird, I followed my heart's direction and, on the advice of my Illuminator, I could fly off to Ibiza soon after selling my house. Then, when it came time to book flights, something possessed me to also search for transatlantic ocean passage. I had been flying all over the globe for years, coming from the airline industry, I wanted to stay close to Earth for a change. 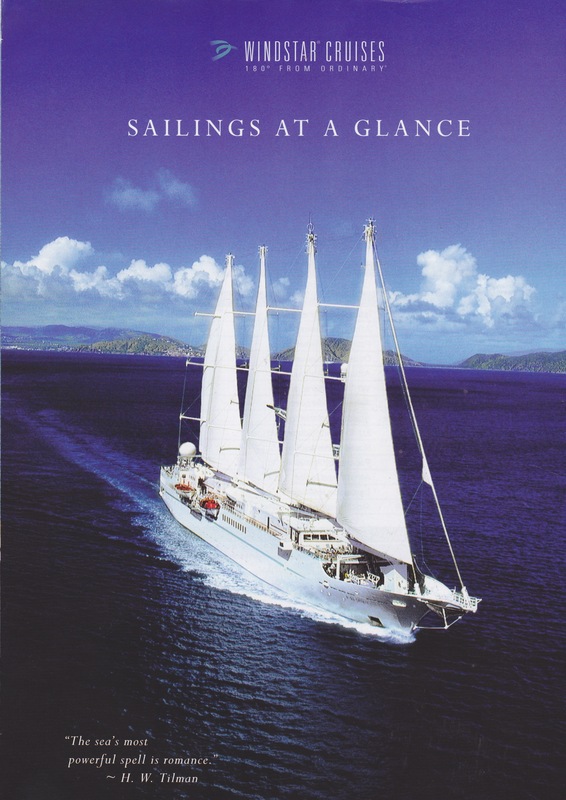 I had no sooner made the decision that I found that the "Windstar" a luxury sail cruiser was doing her yearly repositioning crossing from the Caribbean to the Mediterranean sea. I booked a flight to her departure point in Barbados and passage aboard the "Windstar" to Lisbon, a Eurorail ticket to Denia, but I could not book my passage on the ferry across from there for some reason. This was a dream come true. I had worked on the "WINDSTAR"s construction in France, in the cost accounting department of A.C.H in 1985. (Les Ateliers et Chantiers du Havre) while on an A.E.I.S.E.C. (Association des Etudiants International des Sciences Economique et Commerce) student exchange. Never dreaming I would ever lay eyes on the "Windstar" again, I was thanking my lucky stars! She was the worlds very first totally computer operated luxury sail cruiser. The silver thread connecting events seemed surreal and I chuckled to myself when I remembered I had sent this desire out to the universe long ago. A bunch of us from the office had gone on a tour of the progress in her construction. The "Windstar" looked like a wee minnow in the midst of the large ships being constructed in the shipyard. Climbing aboard we stood in her bare hull where I exclaimed I could not wait to take a trip aboard her one day!! My colleagues turned to me and said that none of "us" would ever be able to afford to sail on her and I said "want to bet?" I won! Twenty two years later my wish came true! We set sail on the Full Moon in April and landed in Portugal May 5, 2008, by which point i realized it wasn;t my house that was swallowed up by a land slide it was the entire house market - the bottom fell out of it and I had gotten out just in the nick of time. Even tho every need was met in oozing luxury, the transatlantic voyage did not turn out to be as leisurely as I thought it would be. Two days into our fifteen day transatlantic journey one of the passenger's foot was broken when a table crash landed on the top of it. He was an elderly man and when I found him on deck he had his foot soaking in and out of a bucket full of ice water to kill the pain and keep the swelling in check. His entire foot was swollen and there was a nasty gash where the table had broken the top of his foot. He was in excruciating pain but there was no going back, they could call a helicopter at their own expense which they declined. The first- aid kit on board did not contain any type of pain killers. I seized the opportunity to offer him Reflexology to kill the pain! He looked at me kind of queer and said "you aren't touching my foot!" I laughed and explained we could use his hand and ear to kill the pain without going anywhere near his foot! He was open to anything to dull the pain and so he agreed to let me squeeze his hands at first and when he felt the relief from that, he felt confident enough to let me squeeze his ears and then he felt the pain just vanish within minutes. The look of relief on his face soon turned to one of total surprise. He, being a long standing avid sailor, who had to always be prepared for instances such as these at sea, was astounded at how quickly and easily I had eliminated his pain and reduced the swelling on his foot in a mere fraction of the time it would take for the, unavailable, extra strength anything tablet to take effect. To put it bluntly he was stupefied. 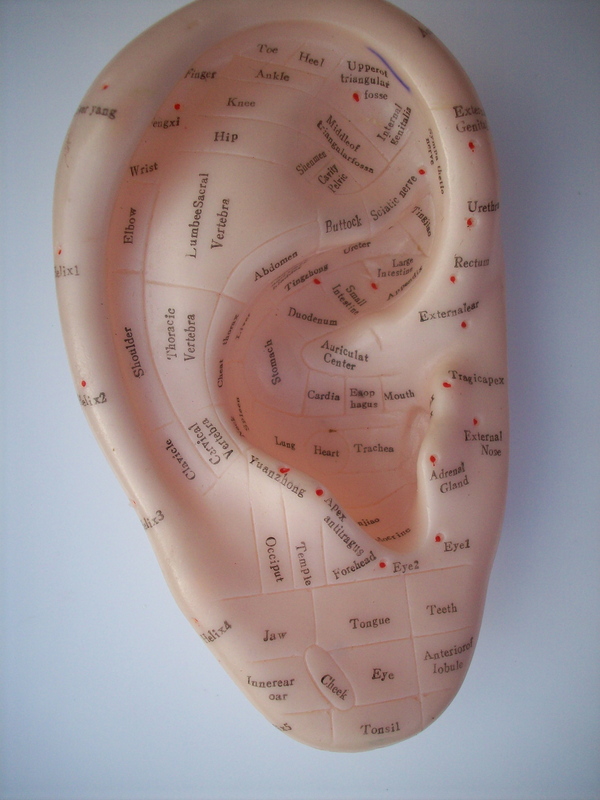 He understood a bit better when I showed him my plastic ear with the map for the reflexes found on the ear. I gave him an ear treatment for three consecutive days, then proceeded to teach his wife how and where to apply the same finger pressure techniques which she carried out on him through the entire transatlantic crossing. They were overjoyed he would not have to suffer. This couple along with many of the others on the crossing were perennial passengers on this transatlantic relocation for they had homes in Europe where they would remain till she returned to the Caribbean in the fall. It wasn't long before the word of my "miracle cure" was buzzing amongst the passengers and crew and I was sought out to help with this or that ailment that they wanted to address. 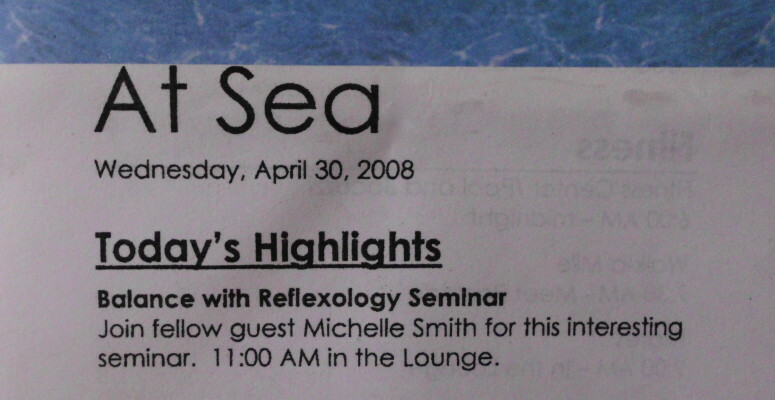 With rave reviews I was kept in my glory the entire 3 weeks at sea doing Reflexology. When I was asked if I would be interested in giving a Reflexology Seminar I jumped at the chance. I put together a Power Point Presentation to introduce everyone to Reflexology basics since many had no idea the benefits it offered. Everyone then got to experience a de-stressing ear treatment to land in BLISS! The Seminar ended by learning how to handle any difficulties they may be experiencing themselves with Hand Reflexology. The passenger with the broken foot was well enough to walk off on arrival in the Port of Lisbon, Portugal, thanking me profusely for relieving him of the pain and discomfort that would have been otherwise unbearable. I was grateful to have helped make a difference. 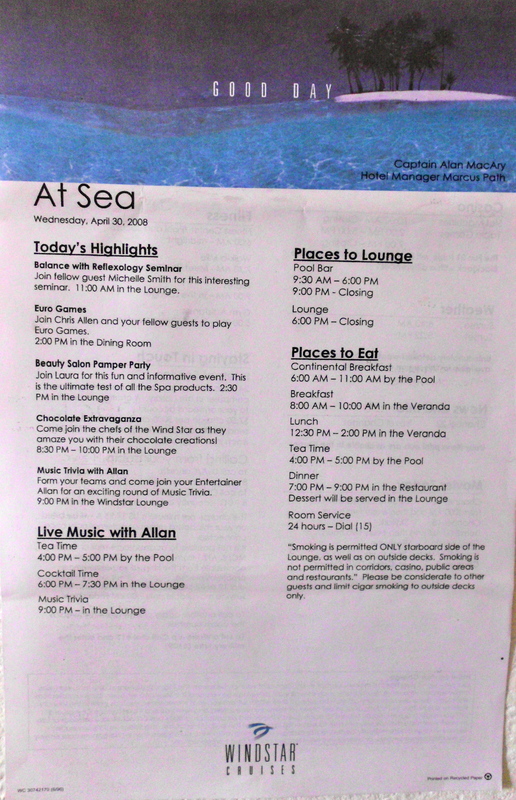 This voyage was a very gratifying experience for me professionally as well as personally. But this was just the beginning of this new golden age for me. I hopped a train to Porto, Portugal where my step-brother and his family met me at the train station and swept me off to stay with them for a spell. Reflexology Seminar for all passengers aboard the "Windstar"
Posted in Classes, Consultations, Couples Classes, Group Classes, Private Classes, Testimonials, Uncategorized.